December 28, 2018 Lorry G.
How and why did we do both? This will take a bit longer to explain. Bear with me. 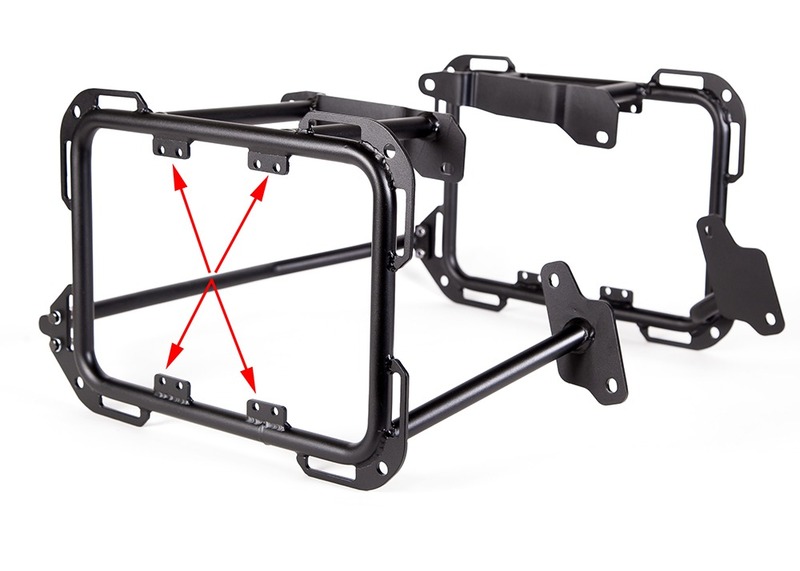 It all began with our X-Frames pannier racks and the concern was exactly the “X” part. 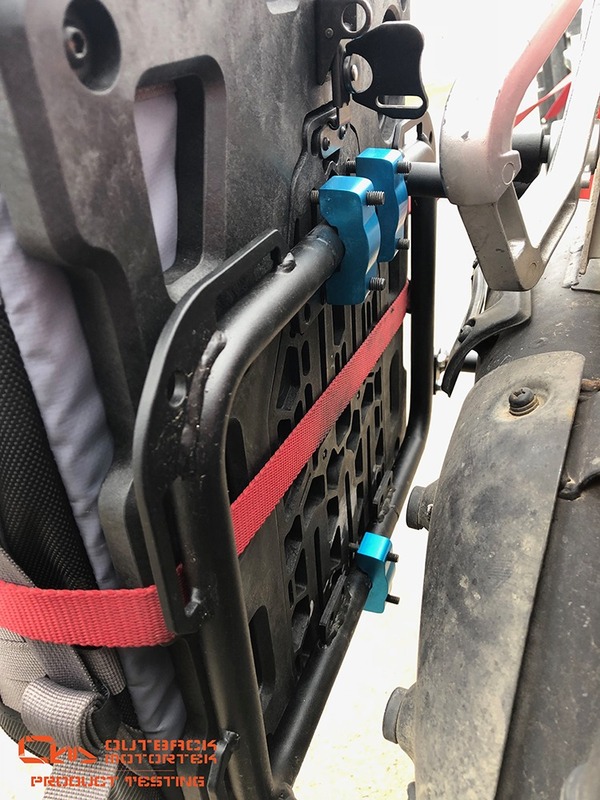 See, the “X” refers to a mounting plate that allows the rider to mount one or two Rotopax fuel storage and/or water storage. 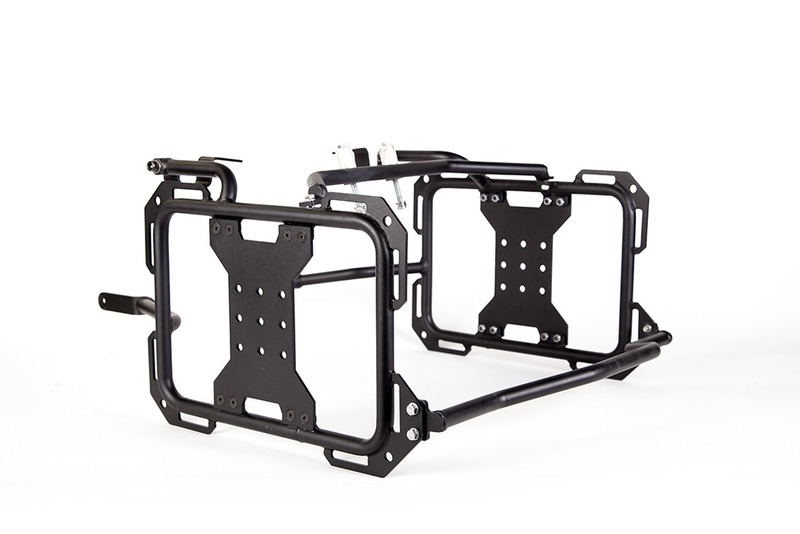 This mounting plate is bolted to four small tabs and the four small tabs are welded on the frame. See photo below. 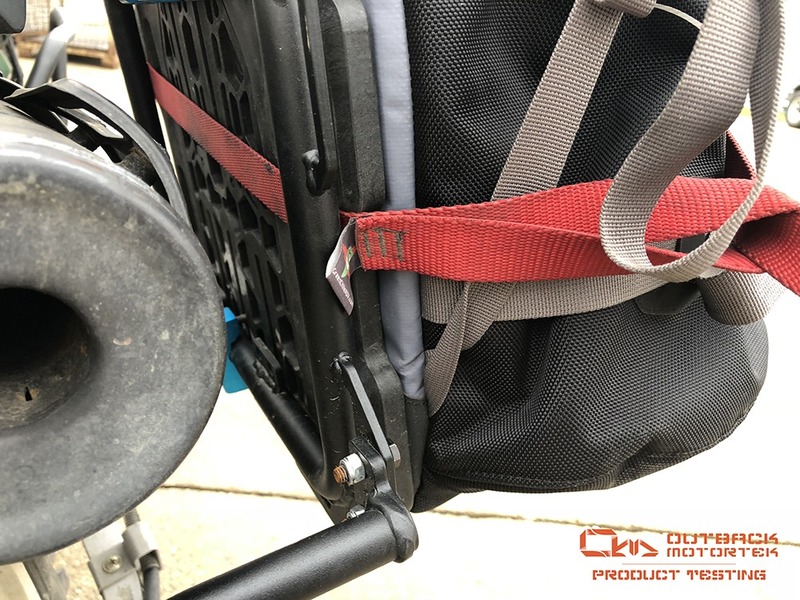 The way Mosko Moto‘s wedges work will partially interfere with two of the small tabs on our pannier racks. 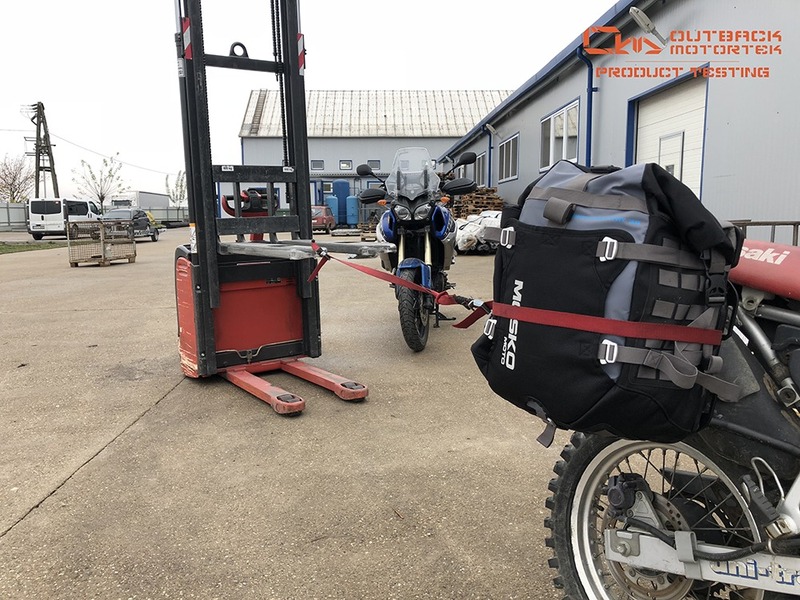 Our solution to this problem was to mount Mosko Moto’s wedge on our pannier racks using only three pucks, instead of the four supplied by Mosko Moto. 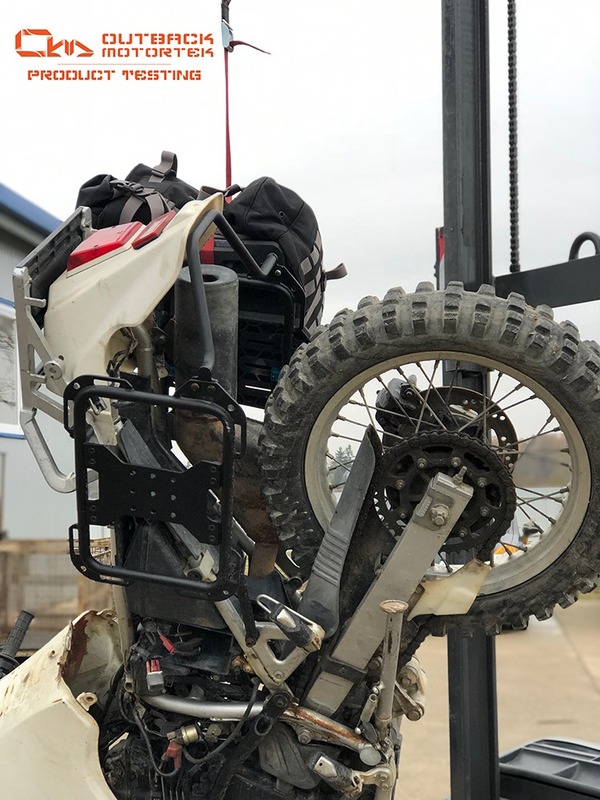 This had raised concerns among riders and potential customers of ours. 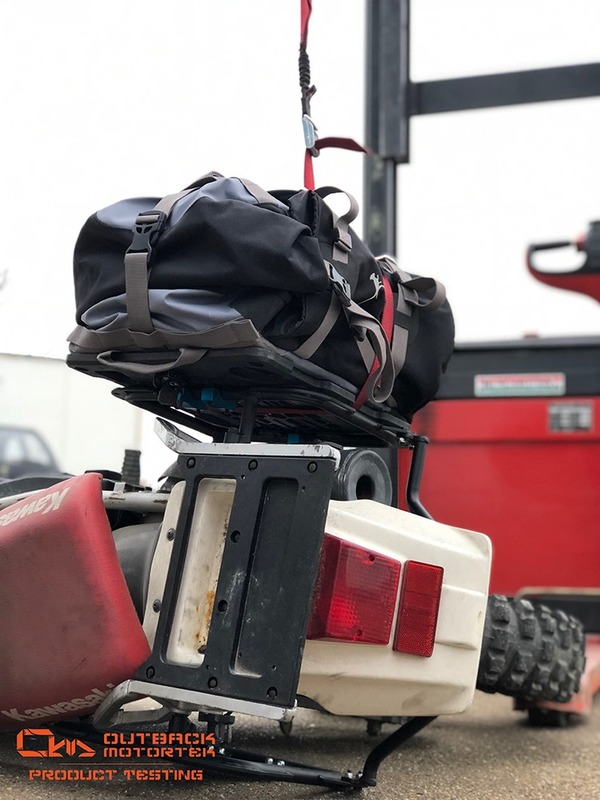 Will three pucks still hold the bag under load, during a crash etc? 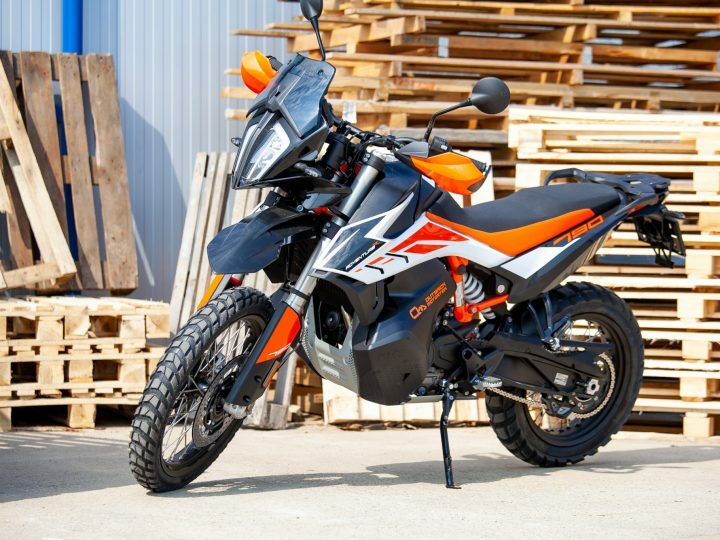 Will it flap or shift at high speed? We were left with nothing but to go back to our imaginary discussion table and figure out a way to prove that it can and will still work. 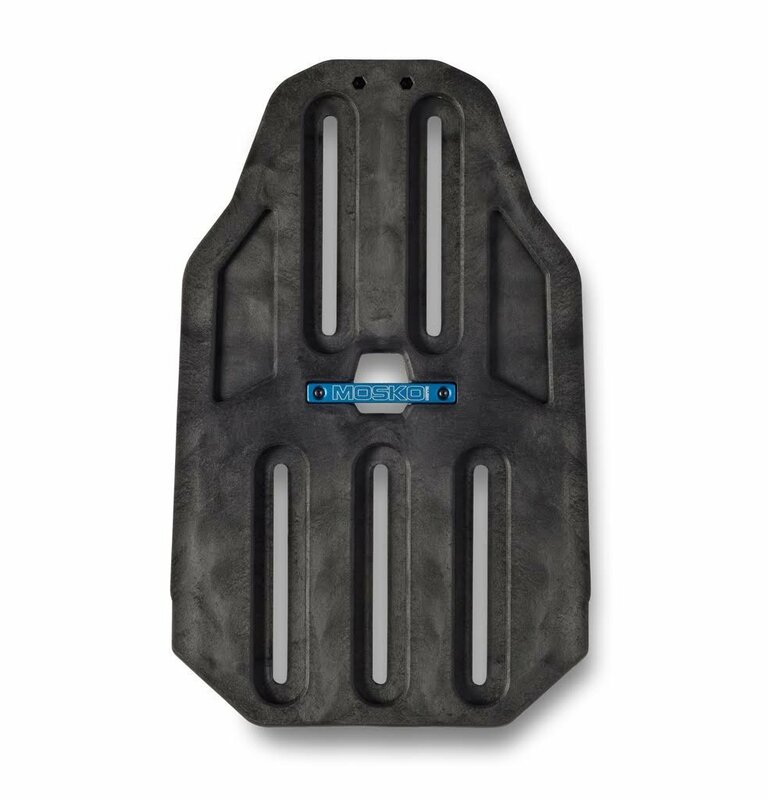 The answer came shortly after: torture test it Outback Motortek style. We laid out a recipe-like list. 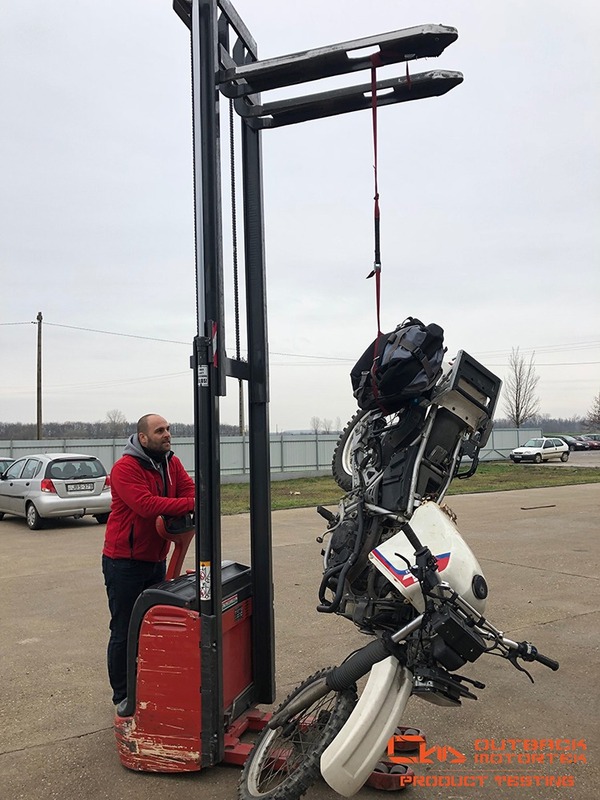 Firstly, we wanted to tow the bike backwards while it was resting on the side stand and applying resistance on this 220kg motorcycle. We also wanted to observe how much the wedge would flex, bend or worst case scenario whether it would break. 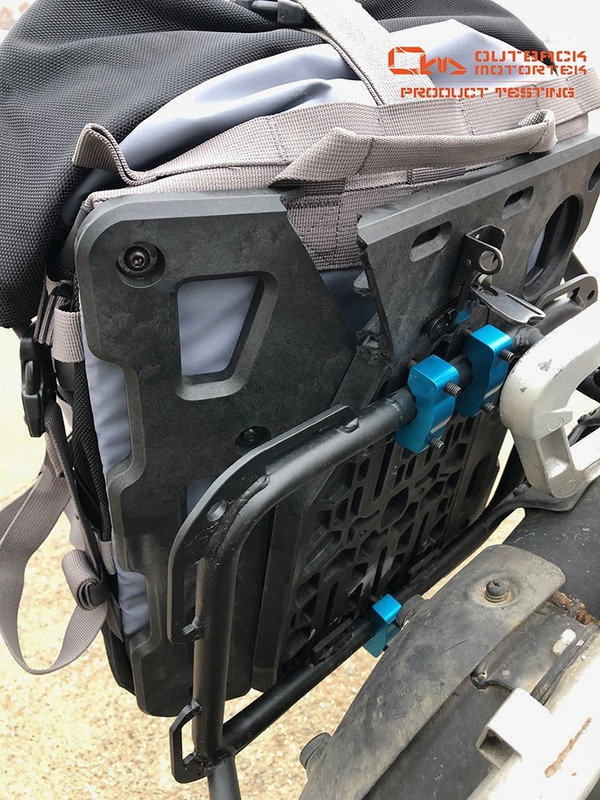 We looped the Green Chile straps around the bag and the wedge (quick release plate), thus all the impact would be dealt by the pucks (anodized, turquoise clamp looking item). Now came the tugging! This was just the beginning. 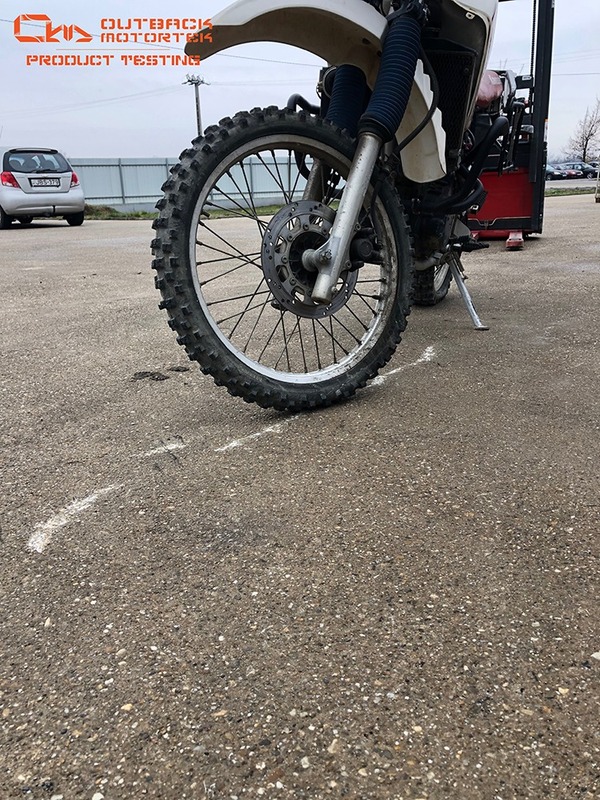 Now we were certain that only three pucks will not be an issue, should the bike crash and slide, not to mention it cleared all the doubts that it would shift and move at high speed. Not a chance! Let’s move to the next level testing. 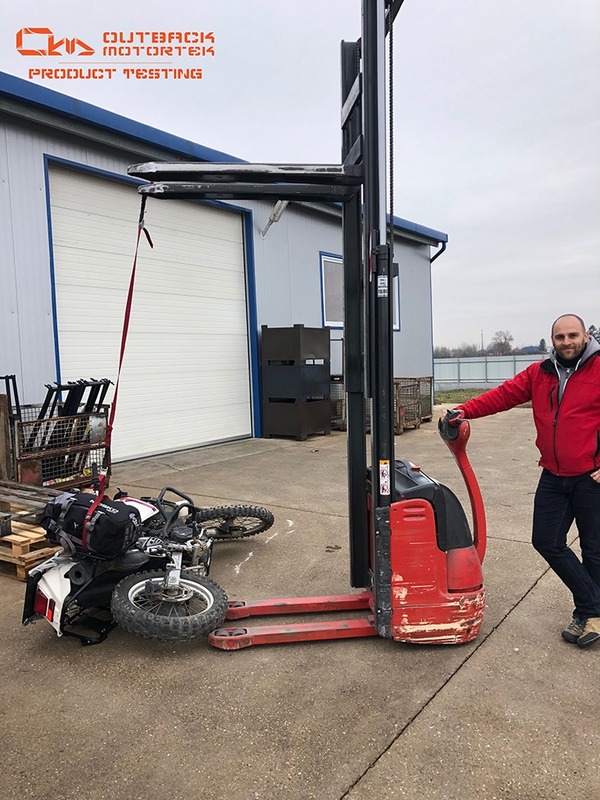 Denes (my brother and warehouse manager) said “Let’s begin lifting this thing!”. I was easily convinced. And up we lifted it. We went a tiny bit too far and the Mosko Moto frame (glass-filled nylon, counterpart of the wedge) broke. 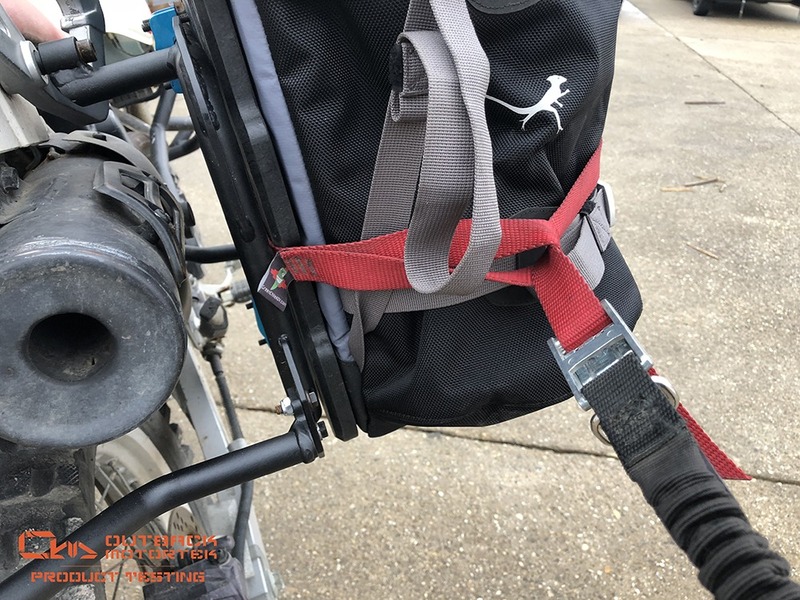 The best part: the bag was still attached to our pannier racks! 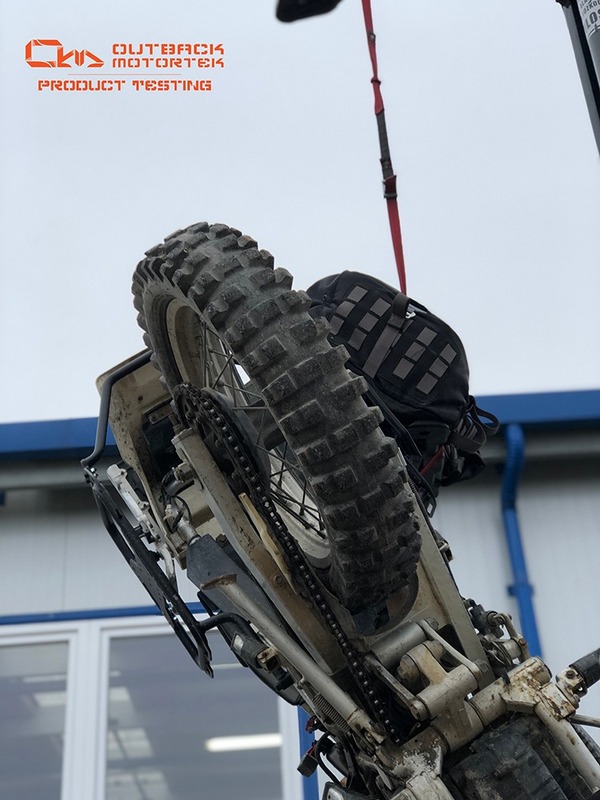 This is an enormous result for both Mosko Moto’s system and our pannier racks. 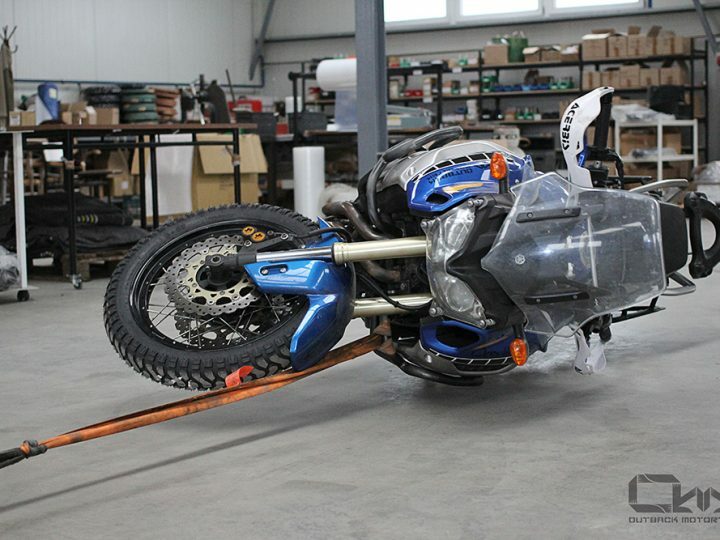 Prior to releasing the photos to the public, we had consulted with the guys from Mosko Moto. They were, too, impressed and were kind enough to endorse it in their latest blog post here. I’ve left the best part of the whole blog post at the end. If pictures worth a thousand words, then surely videos are worth a million. Grab a bag of popcorn and enjoy the compatibility and torture test below. 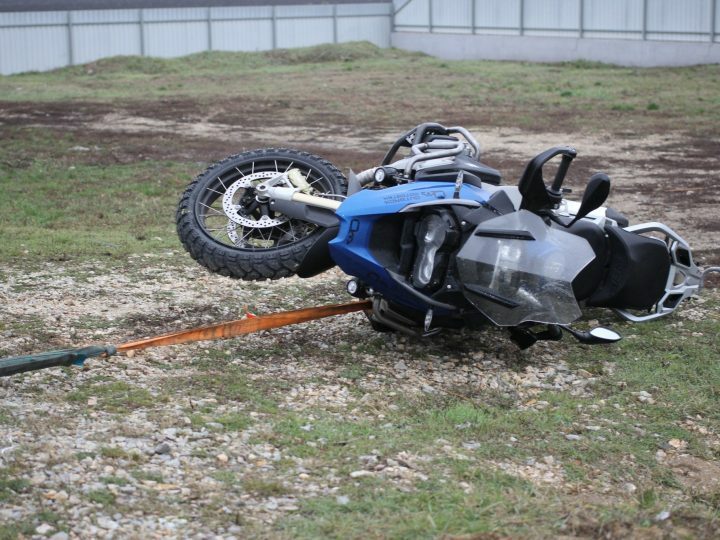 BMW R1200/1250GS Crash Bars Development – Part II. 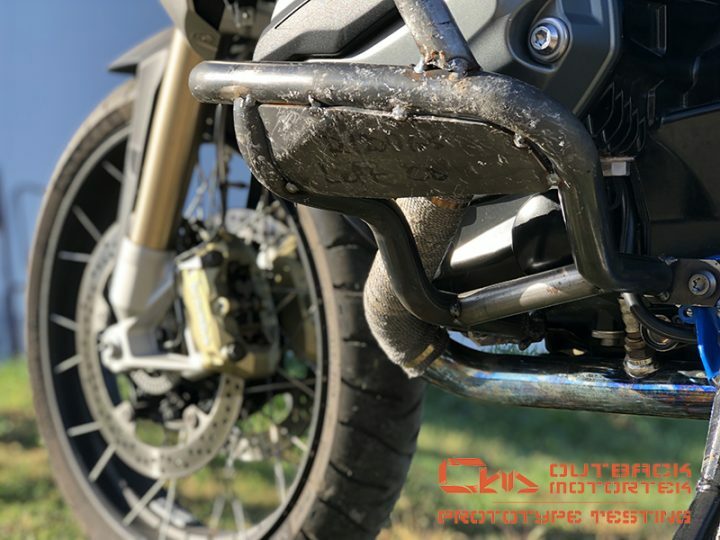 © 2019 Outback Motortek. All Rights Reserved.